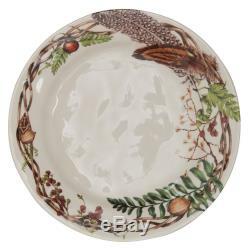 Juliska Forest Walk Dinner Plate - Set of 4. From our Forest Walk Collection- Found treasures from woodland rambles are artfully arranged in a coronet of wildly beautiful things - making a fine nest to frame your main course. Our ceramic stoneware is made in Portugal and is dishwasher, freezer, microwave and oven safe. Oven, Microwave, Dishwasher, and Freezer Safe. If you have any questions or concerns, please don't hesitate to ask. We deal in only BRAND NEW merchandise! The item "Juliska Forest Walk Dinner Plate Set of 4" is in sale since Thursday, March 16, 2017. This item is in the category "Home & Garden\Kitchen, Dining & Bar\Dinnerware & Serving Dishes\Plates".